There are plenty of other apps and websites to help you SEPTA Philly. This is a list of our favorites. The official SEPTA app brings our entire transit network directly to you with convenient access to schedule information, real-time updates, trip planning, fare options, social media connections, and Customer Service. The official SEPTA app brings our entire transit network directly to you with convenient access to schedule information, real-time updates, trip planning, fare options, Perks, social media connections, and Customer Service. 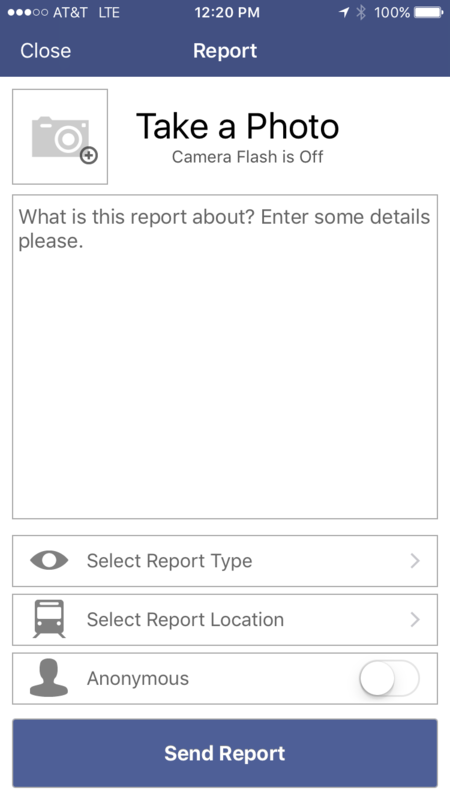 This new app has incident-reporting features that allow SEPTA riders to discreetly share safety & security tips with SEPTA Transit Police. The SEPTA Transit Watch app is available as a free download on both the Apple and Android stores. 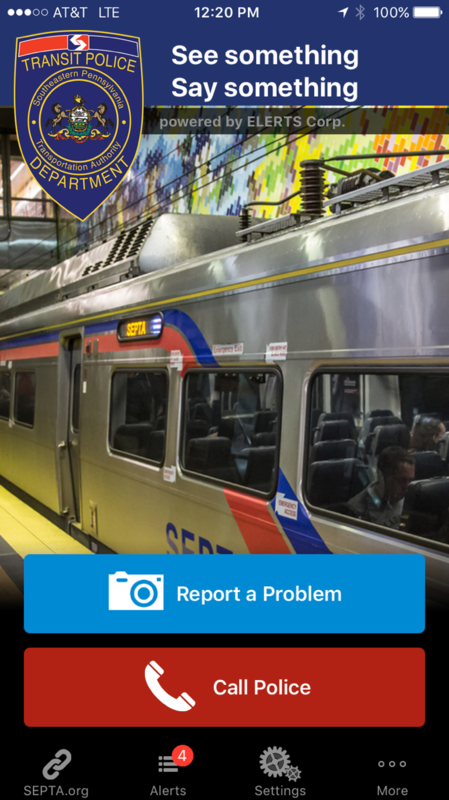 TThe app’s features include: Incident reporting - Including photo/video, a description of what is being observed, and the GPS location of the problem; Discretion - Riders may choose to send reports anonymously and a rider’s smartphone flash is automatically turned off when taking a photo; Two-way communication – SEPTA Police dispatcher may ask questions or provide instructions to the rider; BOLO alerts – “Be On the Look Out” messages may be sent to riders, regarding a person of interest being sought, such as a missing person or a criminal suspect. SEPTA Transit Watch is not just for customers with smartphones. Those with old-style flip phones can use “Text A Tip,” which allows them to reach SEPTA Transit Police with a simple text message to (215) 234-1911. Philadelphia's Office of Emergency Management implemented a new system for city alerts called ReadyPhiladelphia. It's a change from Philadelphia's previous system, ReadyNotifyPA, so users will have to create a new account with ReadyPhiladelphia. Philadelphians can receive notifications about SEPTA delays, including trains, trolleys, buses and subways — via text, email or app alerts through ReadyPhiladelphia. You can sign up here, where everything is customizable, including time and geography. Users can add up to five addresses, and choose whether they want alerts 24/7 or just between business hours.ReadyPhiladelphia will also send alerts for other matters like: City of Philadelphia Government Closings, Delaware River Flooding Alerts, Emergency Alerts, Informational Alerts, PES Refining Complex Alerts, Phila Prison System Community Alerts, Philadelphia Court Closings, Philadelphia Health Information, Philadelphia Police Alerts, Schuylkill River Flooding Alerts, Weather Alerts 24x7 and Weather Alerts 7a - 9p. The PATCO Speedline, also known colloquially as the PATCO High Speed Line, Lindenwold High Speed Line, or simply PATCO, is a rapid transit system operated by the Port Authority Transit Corporation, which runs between Philadelphia, PA, and Camden County, NJ. The Speedline runs underground in Philadelphia, crosses the Delaware River on the Benjamin Franklin Bridge, runs underground in Camden, then runs above ground in New Jersey until the east end of the line. The Port Authority Transit Corporation and the Speedline are owned and operated by the Delaware River Port Authority (DRPA). The line transports over 38,000 people daily. The SEPTA Market–Frankford Line connects to PATCO at the 8th Street Station, which is two blocks away from SEPTA's Jefferson Station, where all but one of SEPTA's Regional Rail trains stop. SEPTA's Broad Street Line connects to PATCO at the Walnut–Locust station via a short underground walkway to PATCO's 12th-13th & Locust, and 15-16th & Locust stations. The Broad-Ridge Spur connects to PATCO at the 8th Street Station via a pedestrian walkway. Penn Transit's comprehensive system provides effective, efficient and safe integrated transit on and around campus within specific service boundaries. Transit Services are free of charge to all Penn community members holding a valid PennCard. Individuals with an I.D. from the University of the Sciences in Philadelphia can also access Penn Buses or Shuttles at no charge. Persons with Drexel I.D. can access the bus service only. Penn Transit’s shuttles and buses can help you travel, to, from and around campus safely and efficiently. When used with other options throughout University City and with specified service boundaries that extend into Center City, riders can utilize an integrated transit system that is accessible year round. Penn Shuttle Service operates 7 days a week, year-round and provides transportation to and from campus to West Philadelphia, Center City (late nights and weekends only) and Powelton Village within defined boundaries. Penn Bus East and Penn Bus West operate Monday through Friday year round, with the exception of all holidays observed by the University, and operate on a fixed schedule and an established route, picking up and delivering passengers at designated stops on campus and at any intersection with a stop sign or light along its route off campus. Penn’s compact urban campus is well served by an extensive network of subway, bus, regional rail, national rail, car-sharing, and trolley lines that are located around the campus where public transit stops are never more than a five-minute walk from any part of campus. The University provides a number of programs to encourage faculty, staff, students and visitors to utilize public transportation. For more info, visit the SEPTA Travel Center @Penn to "ask a human" all of your SEPTA questions. Loop through University City (LUCY®): A SEPTA-operated shuttle makes multiple stops between Penn’s campus and 30th Street Station, Monday – Friday, excluding major holidays, from 6:10 a.m. to 7:00 p.m. This shuttle service is managed by the University City District, and is free for students, faculty and staff at University of Pennsylvania, University of Pennsylvania Health System, University City Science Center and Children's Hospital of Philadelphia who present their institutional ID cards. All others can ride LUCY with standard SEPTA fare. Lucky for you, SEPTA tokens can be purchased in many locations across campus. Click here for LUCY schedule and route information. Click here for SEPTA information. For a comprehensive Penn Transit Map, click here. For detailed service info, click here. The City of Philadelphia launched Indego in 2015 as the city’s newest form of public transportation. It’s simple – with hundreds of self-service bikes and and more than 70 stations, Indego offers 24/7 access to the City on your schedule. Whether you use Indego for transportation, recreation, fitness, fun, or just to hang with friends – Indego is for you! So, where are you Indegoing? This SEPTA travel feature offers Regional Rail riders real-time, point to point, schedule train information for trips between any two stations on our Regional Rail system. NTA is based on real time schedule information and will show the trips closest to the time you submit a request. If there are no trains ready to depart, then trip options based on scheduled train departures will be provided. For more info, click here. Aside from services provided within the five county region, SEPTA works with neighboring transportation agencies to ensure connecting services, where possible, help travelers wishing to set out and explore more distant destinations. The agency websites linked here are all providers whom connect from SEPTA stations and extend the reach of our transportation network. Never miss your SEPTA bus again. Open up the app and boom: upcoming departure times for all nearby transit lines are displayed in big text and bright colors. Plan your trip, set reminders, get notifications about disruptions. You can even request an Uber, reserve a car2go or grab the closest bike share. GoPhillyGo is a new online mapping tool for the Greater Philadelphia area. There are two (2) easy ways to use the map: Explore Nearby Locations or Help Me Find Directions. The goal is to get you around the Greater Philly area by bike + foot + public transportation, combined. GoPhillyGo. Travel farther.